The FILOTEXNO Art Gallery faithful at the rendezvous with the art viewers starts with the opening on Tuesday 19th of February the exhibition The Colours of Greece of 37 Greek Artists (Asprogiannis, Asimakopoulos, Bouranis, Chloi, Daskalakis, Dimas, Gatzonis, Georgas, Georgiou, Georgopoulos, Hazaridis, Htenidis, Katapodis, Kaziridis, Krideras, Konstantakis, Levan, Manoudeas, Mantzios, Melas, Mellidis, Mouratidou, Papadopoulos, Petalidou, Ralli, Seremetis, Sideras, Soragia, Stavrou, Topouria, Tselios, Tsimogiannis, Vlachogiannis, Zachariou, Zartaloudis, Zenetzis, Zervos). 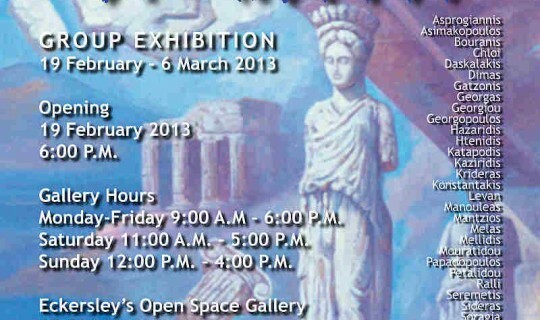 118 paintings dominated by the history and topography of Greece hosted at the Eckersley's Open Space Gallery. The blue of sea and the fervour of the olive colour dominate, expressing the authors' psyche. The Ancient Greeks created what has become known as classical art. Many of world's governmental buildings have been designed with Classical Greek structures. Greeks are seen by many as the cornerstone to the western traditions of art and ideas. The Ancient Greeks are known for three major art forms; their sculptures, their temples, and their vase paintings. The art work embodies much of what made the Greek civilization great. The Ancient Greeks were organized into independent city-states. In these states the ideas of courage, valor, and independence were strongly held values. These themes can be seen very clearly in their human depictions. The Greeks idealized humans, showing the strong and youthful depiction of men and women. The topics shown in their vases reflect the importance of strength, athletic competition, and battles. Their temples reflected their religious beliefs in the gods. The arts of ancient Greece exercised an enormous influence on the culture of many countries all over the world, particularly in the areas of sculpture and architecture. In the West, the art of the Roman Empire was largely derived from Greek models. In the East, Alexander the Great's conquests initiated several centuries of exchange between Greek, Central Asian and Indian cultures, resulting in Greco-Buddhist art, with ramifications as far as Japan. Since the times of the ancient Greeks, Art History records a relentless quest for Realism and artistic excellence in realistic paintings and sculpture. The sea and its pictorial representation have been one of the most developed art genres since many centuries ago. From the classical to the contemporary visions of Nikos Krideras or Dimitris Asprogiannis, the bold Greek Painting or -of course- the incomparable Pavlos Papadopoulos, the FILOTEXNO Art Gallery proudly presents more than 10 of the most beautiful, intrepid, important seascapes. The seas of Greece are sprinkled with over two thousand islands and islets. The Greek islands, with their unique topography, history, and culture attract millions of visitors from around the world every summer. Tourists flock to the Greek islands every year to enjoy a few days of beautiful weather, unique architecture, and Greek hospitality. With so many islands to choose from, one is bound to find their favorite vacation spot, and while many prefer to island hop, others return to the same island year after year. The gamut of character is incredibly wide. Alongside the most popular Greek islands are the quiet holiday spots with sleepy villages, picturesque promenades, endless sunny days, and crystal clear waters. The unique topography, the long history of invasions, and the long tradition of commerce imprint each island with unique characteristics. The paintings of Nikos Krideras, Vassilis Zenetzis, Dimas are inspired by their imagination and the seaside towns, landscapes of Greece where they spent many summers visiting family and friends. Their styles are influenced by continuous study and develop a vision of impressionism and realism. The art of Spyros Georgas stamped from interventions-interventions in new multilevel places, where expression elements are solid materials. Georgas illustrated children's books and created posters for plays, music festivals in America, as well as advertising creations. He recently also issued a study book around the activities of color in nature and art. Zachariou says: "The detail of the project, the exact graphic and a correct colour perception is the main element that expresses my works. My work is generally structured in artistic light and design bases with rich emotion and sensitivity." The exhibition is proudly supported by the Pan-Macedonian Association of Melbourne and Victoria and the Australian Institute of Macedonian Studies. The Open Space Gallery is a relaxed, contemporary exhibition space, situated in the city and is open seven days a week. The FILOTEXNO Art Gallery was established by Evangelos Parameritis in 1997 and since then has obtained substantial experience and expertise in the sector of visual arts. Today, it operates in the separate showrooms where permanent artwork exhibitions of the best known Greek artists are taking place. The love and passion for art as well as the ongoing search are the qualities that make us effective in an outstanding way in the selection of the most valuable works of art.